In the age of electromobility, workshops need extensive knowledge on working safely with high voltages in vehicles. ZF conveys this knowledge worldwide in tailor-made training programs. Frank Thoma has been corporate editor at ZF since 2011. With a degree in journalism, he has been writing and editing articles for all of the company’s internal, external print and online media. There's no doubt about it: The future of mobility is electric. The steady increase in hybrid electric and all-electric vehicles on the roads speaks for itself. Experts expect about 30 percent of all motor vehicles to be all-electric or at least powered by a hybrid drive by 2030. For service providers and workshop operators, this development poses a huge challenge. After all, their employees will increasingly have to deal with high-voltage systems in the new generation of vehicles. Among these are also employees of relief organizations, such as firefighters or breakdown services. They too need to be proficient in the safe handling of electrically driven vehicles that have been involved in accidents or broken down. After all, voltages of currently up to 800 volts occur here. ZF offers these target groups, among others, training as a certified High Voltage Expert – and has been doing so for quite some time. ZF Aftermarket, the Group's service organization, has been offering High Voltage trainings as part of their training program since 2012. As a result, the organization's knowledge and experience in this field is extensive. ZF's instructors train target groups worldwide. Dr. Ulrich Walz, location manager in Schweinfurt and head of Product & Market at ZF Aftermarket, explains how this came about: "Whether we are looking at autonomous taxis, electrically driven buses or the interconnection of different modes of transport, we can see what direction the market is taking and can proactively implement new solutions for products and services." Participants at a High Voltage training in China look at the various systems in an electrically driven vehicle. One of the important factors of the High Voltage Expert training is theoretical knowledge and conveying how to handle high-voltage systems professionally in automobiles. On the other hand, the training itself has to be carried out as efficiently as possible. For this reason, ZF decided to adopt a modular learning concept. This means that "the" High Voltage training does not exist. Rather, there are several possible combinations of training modules. This allows the training to be adapted to the needs of the participants as well as their various levels of existing knowledge. Apart from this flexible delivery of content, the modules offer another benefit: The High Voltage training program follows the blended learning principle. "Blended learning means that we use a total of nine e-Learning modules for the theoretical part. Participants can work through these at home in their own time. Then there is a multi-day practical part, which takes place either at ZF or on the customer's premises. This modern method of knowledge transfer saves time, offers participants a lot of flexibility and is therefore cost-effective," says Andreas Leibinger, head of Service Management at ZF Aftermarket. The first stage of the High Voltage Expert training is a program consisting of six e-Learning modules that convey basic electrical engineering knowledge. Among other topics, these trainings convey fundamental principles of electricity, hazards posed by electric currents, alternating current and electric motors as well as circuit and measurement technology. This is followed by a three-day practical training session. This first learning unit is concluded by a 30-minute online test. The second stage consists of a training program that is concluded by obtaining the High Voltage qualification. Here, three e-Learning modules are also followed by a three-day practical training session. 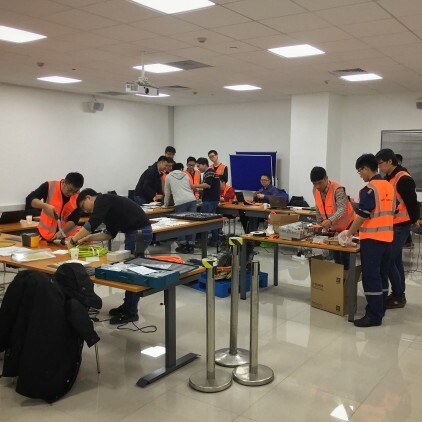 In this stage, participants will look at topics such as cable assembly, troubleshooting in a high-voltage system, exchange of components and release measurements. This part of the training is concluded by a 60-minute test. With this training offer by ZF, participants gain the knowledge required to handle this new technology safely. In addition, it opens up new business possibilities that the target groups can then implement in their workshops. "Because our High Voltage trainings are run independently of brands, we can significantly expand our customer base for this future-oriented service," says Leibinger. Practical instructions during the High Voltage training, carried out directly on the vehicle, shown here at ZF. Click here for further information on the ZF Aftermarket trainings offer for passenger car and light commercial vehicle workshops as well as for truck workshops.